Emily Rosca | The Phoenix A panoramic view of Chicago's glistening skyline is accessible to those who make the excursion out into the calm waters of Lake Michigan by paddleboard or kayak. 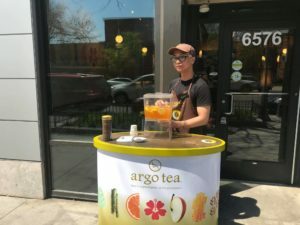 The school year has come to a close and the weather is warming up, which means summer in Chicago has finally arrived. From its extensive food scene to activities perfect for sports enthusiasts, Chicago has an activity suitable for almost everyone. The Phoenix rounded up six bucket list-worthy outdoor activities. While the Windy City isn’t known as a beach destination, tourists and Chicagoans alike can enjoy the sunshine and sand at one of Chicago’s many beaches. 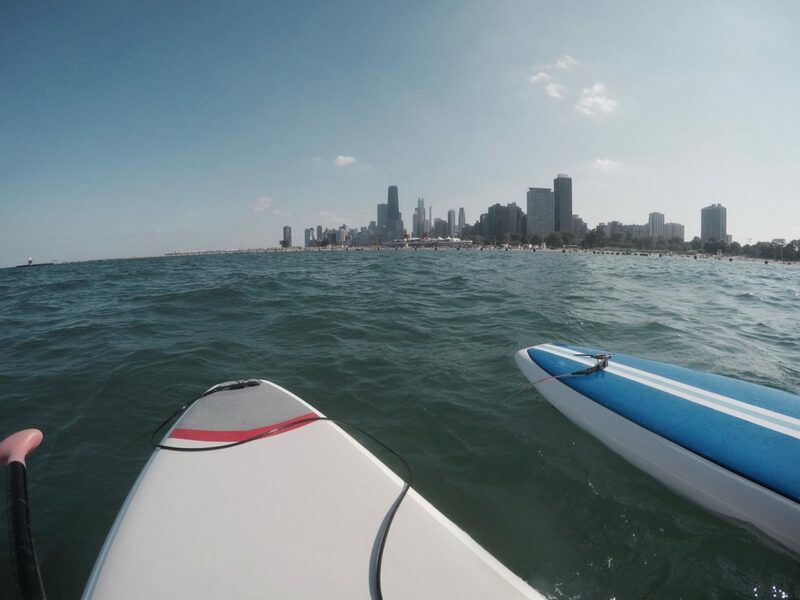 Chicago SUP (stand-up paddleboarding), located at North Avenue Beach (1600 N. Lake Shore Drive), brings Californian surfing vibes to Chicago. SUP might be one of the city’s most adventurous summer activities — marvel at the view of the city’s coastal skyline while exercising and cooling off in Lake Michigan. Chicago SUP opened its shop in 2009 offering paddleboard rentals, stand-up paddleboarding lessons and yoga and fitness classes. SUP is a hybrid between surfing and kayaking, where people stand on an oversized surfboard and wade through the water with a single-oar paddle. Chicago SUP will open Memorial Day weekend for its 2018 summer season. Board rentals cost $32.70 per person per hour. Students can receive $10 off with a valid student ID Tuesday-Thursday. It’s difficult to tire of Chicago’s breathtaking skyline, and the perfect way to experience it is from a worm’s-eye view while kayaking the tranquil waters of the Chicago River. Urban Kayaks offers a variety of kayaking experiences from tours to self-guided paddles. 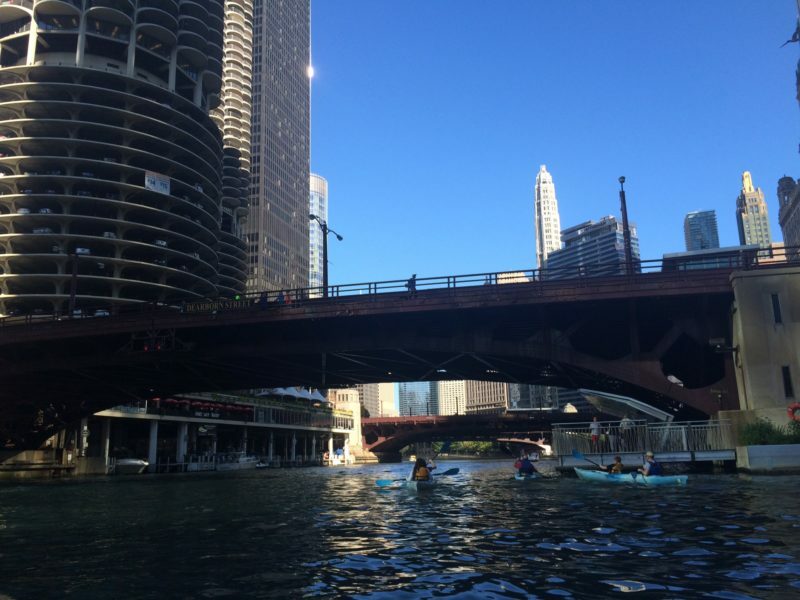 The historic tour, Urban Kayak’s most popular tour, takes kayakers on a sightseeing excursion of the Chicago River. A sunset tour is also offered, allowing kayakers to experience the Chicago River with fewer boats while appreciating the sunset. Previous experience is required to paddle alone, and training sessions are offered before tours. Rentals cost $30 per person per hour, and tours cost $65 per person. Learn about Chicago’s captivating architectural history by embarking on a 75-minute Wendella boat architecture tour. Chicago’s Original Architecture Tour will navigate the three branches of the Chicago River, departing from the Wendella Dock (400 N. Michigan Ave.) near the Trump Tower. The tour is led by a professionally-trained guide who narrates the rich history of Chicago’s iconic, and ever-changing skyline. If guests aren’t architecture buffs before this tour, they’ll likely become aficionados afterward, or at the very least, enjoy an exciting day of sightseeing. The Wendella boat tour costs $39 per adult. Tickets are 50 percent off Tuesdays for college students with a valid student ID. Surrounded by the city’s glistening and well-known skyline, Maggie Daley Park provides Chicagoans and visitors a unique park experience. Newly opened in 2015 in honor of the former first lady of the city, Maggie Daley Park features a field house, skating rink, climbing walls and tennis courts, as well as landscaping and children’s playgrounds. The skating ribbon — used as an ice-skating rink during the winter months — is converted to a rollerblading ribbon beginning March 28. At the center of the skating ribbon, two climbing walls are designed to give beginners and experts a unique outdoor climbing experience. First-time climbers are required to complete a certification course, after which climb-time is unlimited. Climbing prices range from $10-$19 per person, and rollerblade rentals cost $12 for half an hour. Round-up the picnic blankets and lawn chairs and head over to Millennium Park’s Jay Pritzker Pavilion (201 E. Randolph St.) for the fifth annual Summer Film Series. Movie-goers will experience films under a blanket of stars, surrounded by Chicago’s illuminating skyline. Films are shown on a state-of-the-art, 40-foot light-emitting diode (LED) screen. The Summer Film Series screenings include a wide variety of films. In past years, screenings included award-winners such as La La Land and Hidden Figures, and family classics, including Grease and The Princess Bride. Sponsored by the ChicagoMade Shorts program, original works by locally-based filmmakers will be shown before each movie screening. Admission is free, and entrance to the film series is on a first-come, first-served basis. The Summer Film Series will run June 5-August 21 on Tuesday Evenings at 6:30 p.m.
For those looking to take a break from the hustle and bustle of city life, Lincoln Park Conservatory (2391 N. Stockton Drive) offers a peaceful escape. The conservatory’s Victorian Era green house is home to hundreds of lush, tropical plant species. Plants are showcased in four rooms — Palm House, Fern Room, Orchid House and Show House. Located on the outskirts of Lincoln Park Zoo, guests can take a stroll through Chicago’s only free zoo after wandering around the conservatory — one can never be too old for a trip to the zoo. The conservatory is open 9 a.m. to 5 p.m. and the zoo is open 7 a.m to 4:30 p.m. daily. Admission into both is free.